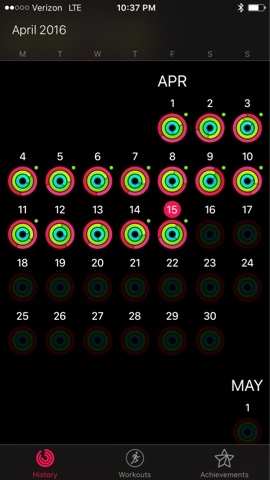 The 30 days of fitness challenge is rolling on and so far April has continued to be a perfect month! This week was not easy to meet the challenge, but it worked out with a little perseverance and some creativity. I had three nighttime activities this week on top of my normal work day which made it hard to squeeze in workouts. On Tuesday I got active enough on my own without officially "working out." Tuesday was a busy day at school and then I walked a few blocks after the kids left to pick up my race bib and packet for the Main Street Mile race the following day. That activity level was enough to push me past my 30 minute goal. On Wednesday, Brody and I ran the Main Street Mile. 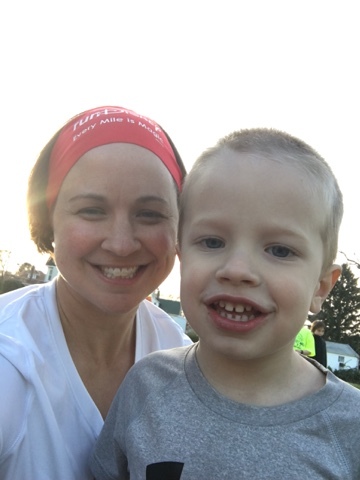 It was his first race and he rocked it! Mommy was so proud! Between the run and a few quick cardio exercises when I got home, I cleared my goal again. And on Friday, I had a "no excuses" day and stopped by the gym for a quick workout before picking the kids up and then heading back to school to chaperone our movie night. One of the things I'm learning through this challenge is how to blow through excuses. The choice to get active and workout is truly a case of mind over matter. Despite an exceptionally full plate this week, I found a way to meet my goals. I think this is one of the biggest things I wanted to prove to myself during this month. I have often found myself saying "It's too late" or "I'm too tired"' or "There's not enough time." But now I see those are just excuses - not real barriers. Life will always be busy and there will always be other things to prioritize over exercise, but now I see that if I choose not to exercise, it is just that. . .a choice.